Sloth is the fifth Homunculus created by Father. Appearing as a giant, muscular, but mentally slow man, Sloth spends most of the story digging the country spanning underground tunnels that make up the Father's mysterious transmutation circle. A conversation between Greed and Lust implies that Sloth have dug tunnels for at least a hundred years. Not surprisingly, he seems eager to finish his work so he can rest at last. 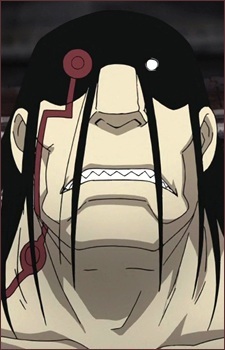 In the first anime, Sloth was inadvertently created in the failed human transmutation of Ed and Al, and appeared as their mother, quite the opposite of what he is characterized as in Fullmetal Alchemist: Brotherhood. After completion of the tunnel, Sloth is ordered to Central on the Promised Day, where he is to kill anyone who could potentially ruin Father's plan, most notably General Armstrong. She manages to hold him off with the help of her younger brother, but the appearance of the Mannequin Soldiers and Central troops throw off their tactics. Sloth reveals his Homunculus trait, the ability to move at supersonic speeds, and nearly kills the two before Izumi and Sig Curtis arrive and help destroy Sloth's Philosopher's Stone.